This is a list of properties on the National Register of Historic Places in the U.S. state of Michigan. 44°42′36″N 83°16′20″W﻿ / ﻿44.71°N 83.272222°W﻿ / 44.71; -83.272222﻿ (Sturgeon Point Light Station) Haynes Township Built in 1869, the Sturgeon Point Light Station is a lighthouse on Lake Huron in Alcona County near the city of Harrisville in northeastern Lower Peninsula. It was built to ward mariners off a reef that extends 1.5 miles (2.4 km) lakeward from Sturgeon Point. 45°04′05″N 83°26′30″W﻿ / ﻿45.068056°N 83.441667°W﻿ / 45.068056; -83.441667﻿ (Alpena County Courthouse) Alpena Built in 1934 in the county seat of Alpena, this Art Deco courthouse continues to serve Alpena County. 45°03′37″N 83°25′23″W﻿ / ﻿45.060278°N 83.423056°W﻿ / 45.060278; -83.423056﻿ (Alpena Light) Alpena The Alpena Light was constructed in 1914 to mark the entrance of Thunder Bay River at the western end of Thunder Bay. The lighthouse remains active. 45°04′53″N 83°26′57″W﻿ / ﻿45.081389°N 83.449167°W﻿ / 45.081389; -83.449167﻿ (Fishing Tug Katherine V) Alpena The Katherine V is a former fishing tugboat that is now on display at the Besser Museum of Northeast Michigan right next to Alpena Community College in Alpena. It is believed to be the last intact wooden fishing tug left. 45°03′40″N 83°25′57″W﻿ / ﻿45.061238°N 83.432638°W﻿ / 45.061238; -83.432638﻿ (IOOF Centennial Building) Alpena This building was constructed in 1876 for Samuel E. Hitchcock and his wife, Samantha Hitchcock, two of the first settlers and most prominent citizens of the city of Alpena. In 1901 it was sold to the local chapter of the Independent Order of Odd Fellows (I.O.O.F. Alpena Lodge No. 170). 45°11′35″N 83°19′16″W﻿ / ﻿45.193056°N 83.321111°W﻿ / 45.193056; -83.321111﻿ (Middle Island Light) Alpena Township Located on Middle Island about 10 miles (16 km) north of Alpena, it is about halfway between Presque Isle and Thunder Bay Island. 45°11′50″N 83°43′11″W﻿ / ﻿45.197314°N 83.719847°W﻿ / 45.197314; -83.719847﻿ (Norwegian Lutheran Church Complex) Leer The Norwegian Lutheran Church Complex includes a church, parish house, cemetery, and pavilion. The church is substantially the same as when it was built in 1899. Highlights include an altar painting by Sarah Kirkeberg Raugland, and an unusual pressed metal interior in the parish house. 44°57′53″N 83°06′14″W﻿ / ﻿44.964833°N 83.103933°W﻿ / 44.964833; -83.103933﻿ (Pewabic (propeller) Shipwreck Site) Alpena Township The SS Pewabic was a package freighter that served ports on the Upper Great Lakes. She was launched in October 1863, fitted out in the spring of 1864, and was in active service until she sank off Thunder Bay Island in Lake Huron on August 9, 1865, due to collision with her sister vessel. 45°02′14″N 83°11′40″W﻿ / ﻿45.037222°N 83.194444°W﻿ / 45.037222; -83.194444﻿ (Thunder Bay Island Light Station) Alpena Township Established in 1832, it is one of the oldest operating lighthouses on Lake Huron, although the facility has undergone several additions and improvements. 44°58′33″N 85°12′29″W﻿ / ﻿44.975833°N 85.208056°W﻿ / 44.975833; -85.208056﻿ (Antrim County Courthouse) Bellaire The Antrim County Courthouse was designed in 1879, but construction did not begin until 1904. A new facility was constructed in 1977/78, and this building was vacant until restoration in 1990–92. As of 2014, it houses the Antrim County courts and prosecuting attorney. 44°53′48″N 85°24′56″W﻿ / ﻿44.896602°N 85.415634°W﻿ / 44.896602; -85.415634﻿ (Elk Rapids First Methodist Episcopal Church) Elk Rapids The former Elk Rapids First Methodist Episcopal Church was constructed in 1901 and served the congregation until 2011. It is significant in part due to its distinctive Gothic stained glass windows. The building now houses Elk Rapids Area Historical Museum. 44°53′51″N 85°24′57″W﻿ / ﻿44.8975°N 85.415833°W﻿ / 44.8975; -85.415833﻿ (Elk Rapids Township Hall) Elk Rapids The Elk Rapids Township Hall was built in 1883 as a theater and government center; it was used as a community center for plays, concerts, dances, political rallies and other local events. 44°58′53″N 85°12′17″W﻿ / ﻿44.981331°N 85.204843°W﻿ / 44.981331; -85.204843﻿ (Holtz Site†) Bellaire The Holtz Site, designated 20AN26, is an archaeological site. It was a Middle Woodland period encampment, dating to around AD 200-400, likely inhabited for a short time by people from southern Michigan who traveled north for a season. 44°53′49″N 85°25′04″W﻿ / ﻿44.896944°N 85.417778°W﻿ / 44.896944; -85.417778﻿ (Hughes House) Elk Rapids The Hughes House was constructed in approximately 1868 by a local carpenter as a guest house, located on the stagecoach road between Traverse City and Petoskey. 44°58′43″N 85°12′36″W﻿ / ﻿44.978611°N 85.21°W﻿ / 44.978611; -85.21﻿ (M-88–Intermediate River Bridge) Bellaire The M-88–Intermediate River Bridge is a steel stringer bridge, constructed in 1931–32, with many workers provided by the Depression-era County Relief Committee. 44°58′49″N 85°12′37″W﻿ / ﻿44.980278°N 85.210278°W﻿ / 44.980278; -85.210278﻿ (Henry Richardi House) Bellaire The Henry Richardi House was originally built for Henry Richardi, a late 19th century lumber baron and industrialist, reportedly in an attempt to woo a young woman for a wife. It currently operates as the "Grand Victorian Bed and Breakfast." 43°59′00″N 83°57′37″W﻿ / ﻿43.983333°N 83.960278°W﻿ / 43.983333; -83.960278﻿ (Michigan Central Railroad Standish Depot) Standish The Michigan Central Railroad Standish Depot is a Richardsonian Romanesque structure built using fieldstones gathered by local farmers. It served as a passenger depot until 1955, and is currently used as a welcome center along US 23. 44°02′50″N 83°51′14″W﻿ / ﻿44.047222°N 83.853889°W﻿ / 44.047222; -83.853889﻿ (Second Arenac County Courthouse) Omer The first Arenac Courthouse, dating from 1883, burned in 1889. The county built this second courthouse at the same site in 1890, but in 1892 a county-wide vote moved the county seat to Standish. This building became the Omer Masonic Hall until the Lodge move in 1997. It is now owned by the Arenac County Historical Society. 46°48′43″N 88°28′33″W﻿ / ﻿46.811944°N 88.475833°W﻿ / 46.811944; -88.475833﻿ (Assinins) Assinins Assinins was founded in 1843 by Bishop Frederic Baraga, and is one of the earliest Catholic missions in the Upper Peninsula associated with the Bishop. Baraga built the Old St. Joseph Orphanage and School on the site in 1860; wings were added to the building in 1866 and 1877. The settlement served as an important link in establishing rapport between the local Ottawa and Chippewa tribes and settlers arriving from the east. 46°52′37″N 88°13′10″W﻿ / ﻿46.876944°N 88.219444°W﻿ / 46.876944; -88.219444﻿ (Arvon Township Hall) Skanee In 1915, when this hall was built, the area was still a sparsely settled frontier, and the township government played an important role in the local community. The hall was used as a community center hosted public meetings. It continues to be used for meetings, as well as amateur theatrical productions, community pageants, ethnic music festivals, and other recreational activities. 46°37′31″N 88°28′13″W﻿ / ﻿46.625278°N 88.470278°W﻿ / 46.625278; -88.470278﻿ (Canyon Falls Bridge) L'Anse Township The Canyon Falls Bridge is constructed of a two-hinged, girder-ribbed arch. The configuration of the bridge is highly simplified, with some minimal decoration on ancillary components. Guardrails have ornamental steel rails and balusters, and a decorative concrete pylon tops each arch pedestal. The appearance of the pylons and the profile of the arched ribs gives the bridge a distinctive Art Moderne look. 46°53′37″N 88°32′17″W﻿ / ﻿46.893611°N 88.538056°W﻿ / 46.893611; -88.538056﻿ (Herman and Anna Hanka Farm) Pelkie The Hanka Farm was occupied by members of the Hanka family, Finnish immigrants, from 1896 until 1966. The farm was originally homesteaded at a time of mass immigration from Finland to the United States, as well as a migration from the mining locations in the Upper Peninsula to more rural locations. The homestead is relatively intact and unaltered from its appearance in the 1920s. 46°51′33″N 88°23′50″W﻿ / ﻿46.859167°N 88.397222°W﻿ / 46.859167; -88.397222﻿ (Hebard – Ford Summer House) Pequaming The logging town of Pequaming was founded by Charles Hebard in 1878. In 1915, Hebard's son Daniel built this lodge as his periodic residence. In 1923, Henry Ford bought the town, the mill, and the surrounding 40,000 acres of timber. Ford used the lodge as his summer residence until 1941. 46°47′59″N 88°25′25″W﻿ / ﻿46.799722°N 88.423611°W﻿ / 46.799722; -88.423611﻿ (Kewawenon Mission) Zeba Now known as the Zeba United Indian Methodist Church, the Kewawenon Mission was founded by Methodist missionaries in 1832. The current church is the third such building at the site, and is a vernacular Gothic Revival building covered with hand-made shingling. 46°47′00″N 88°28′00″W﻿ / ﻿46.783333°N 88.466667°W﻿ / 46.783333; -88.466667﻿ (Sand Point Site) Baraga Sand Point is a Late Late Woodland period archaeological site containing the remains of a village and 12 burial mounds. 46°45′16″N 88°29′41″W﻿ / ﻿46.754444°N 88.494722°W﻿ / 46.754444; -88.494722﻿ (US-41 (old)-Backwater Creek Bridge) Baraga Township The Old US-41 – Backwater Creek Bridge is a rigidly connected Warren pony truss, 80 feet long with an 18 foot roadway. Built in 1918, it is one of the earliest examples of a standard Michigan State Highway Department pony truss design in the state. 42°38′53″N 85°17′24″W﻿ / ﻿42.648056°N 85.29°W﻿ / 42.648056; -85.29﻿ (Barry County Courthouse Complex†) Hastings The Barry County Courthouse, designed by Albert E. French, was constructed in 1892–94. The design of the building is eclectic, combining Late Victorian, Queen Anne, and Richardsonian Romanesque elements. 42°42′40″N 85°28′27″W﻿ / ﻿42.711111°N 85.474167°W﻿ / 42.711111; -85.474167﻿ (John Carveth House†) Middleville The John Carveth House, also known as the Aaron Clark House or the Lone Willow Farm, is an elaborate, asymmetrical two-story Queen Anne house built in 1886 by John Carveth, lawyer and state senator. 42°38′24″N 85°30′07″W﻿ / ﻿42.64°N 85.501944°W﻿ / 42.64; -85.501944﻿ (Chief Noonday Group Camp Historic District) Yankee Springs Township In the late 1930s, two group camps in the Yankee Springs Recreation Area were constructed by the National Park Service's Recreation Development Area program: the Chief Noonday Outdoor Center and the nearby Long Lake Outdoor Center, also on the Register. 42°34′56″N 85°30′51″W﻿ / ﻿42.582222°N 85.514167°W﻿ / 42.582222; -85.514167﻿ (Austin H. and Frankie A. Dwight Summer House†) Shelbyville This house was constructed between 1901 and 1902 by Austin H. Dwight and his wife Frankie. The house was significant both for its architecture and or the use of advanced engineering techniques, where timber trusses with iron tie rods were used to house a large public space in the first floor. It was demolished in 2005. After a period of vacancy, the house was remodeled and used as the Bay Pointe Restaurant. It was demolished in 2004 and a new Bay Pointe Inn erected at the site. 42°37′00″N 85°29′41″W﻿ / ﻿42.616667°N 85.494722°W﻿ / 42.616667; -85.494722﻿ (Long Lake Group Camp Historic District) Yankee Springs Township In the late 1930s, two group camps in the Yankee Springs Recreation Area were constructed by the National Park Service's Recreation Development Area program: the Long Lake Outdoor Center and the nearby Chief Noonday Outdoor Center, also on the Register. 42°38′11″N 85°17′05″W﻿ / ﻿42.636389°N 85.284722°W﻿ / 42.636389; -85.284722﻿ (Shriner-Ketcham House) Hastings The Shriner-Ketcham House was constructed in 1868 by local dairy owner and farmer William Shriner. John C. Ketcham, a six-term U.S. Representative, purchased the house from Shriner, and lived there until his death in 1941. 42°38′46″N 85°17′12″W﻿ / ﻿42.646111°N 85.286667°W﻿ / 42.646111; -85.286667﻿ (Daniel Striker House†) Hastings Daniel Striker was an early banker and politician, and in 1870 was elected as Michigan Secretary of State, a position he held for four years. He constructed this house in the 1880s; it was contemporaneously called "the handsomest residence in Hastings." He lived there until his death in 1898. 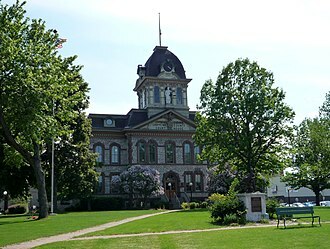 44°37′39″N 86°05′46″W﻿ / ﻿44.6275°N 86.096111°W﻿ / 44.6275; -86.096111﻿ (Benzie County Courthouse) Beulah The Benzie County Courthouse was constructed in 1912 as a recreation center and hotel, named The Grand. In early 1916, Beulah won an election to become the county seat of Benzie County, and the former hotel was converted into a courthouse. 44°38′04″N 86°14′16″W﻿ / ﻿44.634444°N 86.237778°W﻿ / 44.634444; -86.237778﻿ (Frankfort Land Company House) Frankfort The house was constructed by the Frankfort Land Company in the 1860s to provide a residence for company officials living on site. However, the existence of the house - the first stylish building constructed in the town - also advertised the confidence the Land Company had in the potential and economic vitality of Frankfort. It currently operates as the Stonewall Inn B & B, a bed and breakfast. 44°37′52″N 86°15′07″W﻿ / ﻿44.631111°N 86.251944°W﻿ / 44.631111; -86.251944﻿ (Frankfort North Breakwater Light) Frankfort The original Frankfort North Breakwater lighthouse was built in 1873; the current light was built in 1932 the end of what is now the northern concrete pier at the entrance to the harbor of Frankfort. The original pyramid style lighthouse was increased in size by placing it on top of a two-story addition. 44°37′08″N 86°06′05″W﻿ / ﻿44.618889°N 86.101389°W﻿ / 44.618889; -86.101389﻿ (Mills Community House) Benzonia Mills Community House was built in 1909 as Mills Cottage, the girl's dormitory and president's residence for Benzonia Academy. It is significant for its association with Bruce Catton (an alumnus of the Academy and Pulitzer Prize-winning historian), who lived there when his father was president. The Academy went defunct in 1918, and the building was turned into a community center with meeting spaces, a performance space, and housing for the library. 44°37′49″N 86°14′52″W﻿ / ﻿44.630278°N 86.247778°W﻿ / 44.630278; -86.247778﻿ (Navigation Structures at Frankfort Harbor) Frankfort The Navigation Structures at Frankfort Harbor consist of a pair of piers and a pair of breakwaters. The piers, built in 1867–73, have been substantially modified over time, including being significantly shortened after the 1932 completion of the breakwaters. 44°43′00″N 86°07′00″W﻿ / ﻿44.716667°N 86.116667°W﻿ / 44.716667; -86.116667﻿ (Platte River Campground) Sleeping Bear Dunes The Platte River Campground Site, designated 20BZ16, is an archaeological site located along the Platte River. It is significant as a largely intact record of Middle and Late Woodland period prehistoric life over a long span of time. 44°41′08″N 86°15′20″W﻿ / ﻿44.685556°N 86.255556°W﻿ / 44.685556; -86.255556﻿ (Point Betsie Light Station) Frankfort Construction on this light began in 1854 and was not completed until 1858, with service beginning in the shipping season of 1859. The light was the site of one of the earliest Life Saving Station, built in 1875 under the auspices of the United States Life-Saving Service. The Point Betsie light was the last manned lighthouse on Lake Michigan and the last Michigan lighthouse to lose its keeper. 44°33′14″N 86°13′04″W﻿ / ﻿44.553889°N 86.217778°W﻿ / 44.553889; -86.217778﻿ (Watervale Historic District) Blaine Township Watervale was originally platted, and houses constructed, in the 189s by Leo F. Hale, who began logging operations in the area. Hale went bankrupt by 1900, but in 1917, Dr. Oscar H. Kraft of Chicago purchased the town and adjacent land to use as a resort. Kraft and his family have operated Watervale as a resort since that time. 43°49′11″N 84°46′10″W﻿ / ﻿43.819722°N 84.769444°W﻿ / 43.819722; -84.769444﻿ (Clare Congregational Church) Clare The Clare Congregational Church (now the Clare Congregational United Church of Christ) was built in 1908–09, and is one of the few churches in Michigan that reflect the architectural adoption by early twentieth-century Protestants of the Early Christian central plan churches of the fifth- and sixth-century. 43°49′09″N 84°46′06″W﻿ / ﻿43.819236°N 84.768343°W﻿ / 43.819236; -84.768343﻿ (Clare Downtown Historic District) Clare The Clare Downtown Historic District is located in the commercial center of the city, along four blocks of North McEwan Street with adjacent portions of East and West Fourth and Fifth Streets. There are 51 buildings in the district, constructed from 1873 to 2000. Most are two stories, and represent Neoclassical and Commercial Brick, with some Late Victorian, Mid-century modern, and later 20th century architectural styles. 43°50′11″N 84°51′53″W﻿ / ﻿43.836389°N 84.864722°W﻿ / 43.836389; -84.864722﻿ (George and Martha Hitchcock House) Farwell George Hitchcock went into the logging business with his brother-in-law Edmund Hall. In 1871, they founded the village of Farwell. George Hitchcock and his wife Martha hired the Detroit firm of Mason & Rice to design this house; construction was completed in 1885. 43°00′06″N 84°32′56″W﻿ / ﻿43.001667°N 84.548889°W﻿ / 43.001667; -84.548889﻿ (East Ward School) St. Johns The East Ward School was constructed in 1876 from plans by Bay City architect Oliver Hidden. It was unusual for its size and its elaborate brickwork. The school building has been replaced with a housing development and a preschool. 43°00′07″N 84°33′30″W﻿ / ﻿43.001944°N 84.558333°W﻿ / 43.001944; -84.558333﻿ (Giles J. Gibbs Building-Sugar Bowl) St. Johns This building was first constructed by Giles J Gibbs as a grocery. In 1916, Nick Pappas opened The Sugar Bowl at this location, which was run by the Pappas family until it closed in 1970. 43°05′24″N 84°24′21″W﻿ / ﻿43.0899°N 84.4058°W﻿ / 43.0899; -84.4058﻿ (Grist Mill Bridge, Dam and Mill Site) Duplain Township This site consists of three structures: theUpton Road Bridge, one of only three remaining Parker truss bridges in Michigan, the Elsie Mill Pond Dam, a rock and earth-filled dam with a concrete cap, and Kellogg Bros. & Johnson Mill Site, the foundation and associated remains of the 1865 Kellogg Bros. & Johnson grist mill. 43°00′25″N 84°22′16″W﻿ / ﻿43.006944°N 84.371111°W﻿ / 43.006944; -84.371111﻿ (Main Street Building, United Church of Ovid) Ovid This building was constructed in 1872 as the First Congregational Church of Ovid. It was moved to this location in 1899, and used for worship until 1972. It is a frame Gothic Revival structure with a 75 feet (23 m) tall, three-stage two-story square tower topped with an octagonal belfry contains unique decorative touches. 42°54′54″N 84°34′48″W﻿ / ﻿42.915°N 84.58°W﻿ / 42.915; -84.58﻿ (Stony Creek Bridge) Olive Township The Stony Creek Bridge, built in 1880, is wrought iron pin-connected Queen post truss bridge It is the last example of a Queen post truss bridge extant in Michigan. 42°59′52″N 84°33′39″W﻿ / ﻿42.997778°N 84.560833°W﻿ / 42.997778; -84.560833﻿ (Union School) St. Johns The Union School was a state-of-the-art school when it was built in 1885. It served as a school for the St. Johns district until 1986. The building has been replaced with a housing development. 44°48′08″N 84°28′57″W﻿ / ﻿44.802222°N 84.4825°W﻿ / 44.802222; -84.4825﻿ (Douglas House) Lovells Township The Douglas House, also known North Branch Outing Club, was constructed in 1916 by Thomas E. Douglas to draw wealthy tourists to the area. Early club members included Henry Ford and his son Edsel, John and Horace Dodge, and Charles Nash. 44°44′25″N 84°39′14″W﻿ / ﻿44.740278°N 84.653889°W﻿ / 44.740278; -84.653889﻿ (Edward E. Hartwick Memorial Building) Grayling Township The Edward E. Hartwick Memorial Building is a 1-1/2 story rustic log structure built entirely of Michigan pine, and is one of the few remaining examples of the rustic log architecture used in the 1920s and 1930s by the Michigan State Park system. 44°39′35″N 84°42′44″W﻿ / ﻿44.659722°N 84.712222°W﻿ / 44.659722; -84.712222﻿ (M-72–Au Sable River Bridge) Grayling The bridge is significant as perhaps the earliest rigid-frame bridge built by the Michigan State Highway Department, and is the only example of a steel (as opposed to concrete) rigid-frame bridge in Michigan. 45°50′13″N 88°03′10″W﻿ / ﻿45.836944°N 88.052778°W﻿ / 45.836944; -88.052778﻿ (Ardis Furnace) Iron Mountain In 1908, John T. Jones built this experimental blast furnace, named the "Ardis Furnace" after his daughter, to test an iron extraction process he developed. The furnace as originally built was a huge rotating metal tube installed at a slight incline and held in place by a series of concrete supports. The Ardis Furnace was initially a success, but a fundamental heat problem limited its durability, and within two years Jones lost his personal fortune and the project was abandoned. Some elements of Jones's technology were incorporated into later successful operations, but the ruins of the concrete supports are the only remnants of the Ardis furnace. 45°49′30″N 88°04′12″W﻿ / ﻿45.825°N 88.07°W﻿ / 45.825; -88.07﻿ (Chapin Mine Steam Pump Engine) Iron Mountain The Chapin Mine Steam Pump Engine, also known as The Cornish Pump, was built by the E. P. Allis Company (now Allis-Chalmers) in 1890–91, and is still the largest reciprocating steam-driven engine ever built in the United States. It was use in the 1890s at the Chapin Mine "D" shaft, and from 1907 to 1914 at the nearby Ludington Mine "C" shaft. At the "C" shaft, the engine was connected to a series of eight pumps, the deepest of which was 1,500 feet (460 m) below ground. The total capacity of the pump system was 3,400 US gallons (13,000 l) per minute. The system was replaced in 1914 by electric pumps, and the Cornish Pump has served as a tourist attraction since 1934. 45°49′02″N 88°03′45″W﻿ / ﻿45.817222°N 88.0625°W﻿ / 45.817222; -88.0625﻿ (Dickinson County Courthouse and Jail) Iron Mountain The Dickinson County Courthouse and Jail was built in 1896. It is a rock faced red brick Romanesque Revival-style structure designed by architect James E. Clancy of Antigo, Wisconsin. Kingsford The Graved Rock Site, also known as 20DK23, is an archaeological site, thought to be a ceremonial location associated with prehistoric Native Americans. It contains rock carvings. 45°49′59″N 88°03′20″W﻿ / ﻿45.833056°N 88.055556°W﻿ / 45.833056; -88.055556﻿ (Immaculate Conception Church) Iron Mountain The Immaculate Conception Church is an Italian Renaissance Revival church built in 1902 by Italian Catholics living on the north side of Iron Mountain. It was designed by parish priest Father Giovanni Sinopoli di Giunta, who also oversaw the construction of the building. 45°49′10″N 88°04′01″W﻿ / ﻿45.819439°N 88.066946°W﻿ / 45.819439; -88.066946﻿ (Iron Mountain Central Historic District) Iron Mountain This district covers the city's central business district and adjacent areas It is primarily commercial, but also contains the historic county courthouse complex, and school, library, and church buildings. 45°47′00″N 88°05′30″W﻿ / ﻿45.783333°N 88.091667°W﻿ / 45.783333; -88.091667﻿ (Menominee River Park Archeological District) Kingsford The Menominee River Park Archeological District is an archaeological site; the location was a campsite associated with the Woodland period, and is currently used as a recreational park. Kingsford The Up Stream Put-In Site, also known as 20DK27, is an archaeological site; the location was a campsite and water access associated with both the Woodland period and historic Euro-American use. 45°52′39″N 88°04′43″W﻿ / ﻿45.8775°N 88.0785°W﻿ / 45.8775; -88.0785﻿ (Upper Twin Falls Bridge) Breitung Township This highway bridge between Dickinson County, Michigan and Florence County, Wisconsin was built in 1910–11 because the Twin Falls Power Dam would soon flood the previous bridge. It is one of two pin-connected, camelback, through-truss bridges remaining in Wisconsin. Site of liquor inspections from 1914 to 1920, when Michigan was dry and Wisconsin wet. 41°58′59″N 84°39′48″W﻿ / ﻿41.982958°N 84.663264°W﻿ / 41.982958; -84.663264﻿ (J.J. Deal and Son Carriage Factory†) Jonesville The J.J. Deal and Son Carriage Factory was built in portions over the span of 1893–1909. The company produced multiple models of the Deal Automobile here from 1908 to 1911, but went out of business in 1915. It was later used by the Kiddie Brush & Toy Company. As of 2016 it houses the Heritage Lane Apartments. 41°59′03″N 84°39′37″W﻿ / ﻿41.984167°N 84.660278°W﻿ / 41.984167; -84.660278﻿ (Grace Episcopal Church†) Jonesville Grace Episcopal Church is a 1-1/2 story rectangular Greek Revival frame structure covered in clapboard. Built in 1844–48, it is one of the first church buildings constructed in Michigan west of Detroit, and is one of the few surviving examples of indigenous church architecture in the state. 41°58′55″N 84°39′35″W﻿ / ﻿41.981944°N 84.659722°W﻿ / 41.981944; -84.659722﻿ (E.O. Grosvenor House†) Jonesville This house was designed in 1874 by Elijah E. Myers for Ebenezer O. Grosvenor, a politician who served in the Michigan Senate, one term as the Lieutenant Governor of Michigan, and two terms as the State Treasurer of Michigan. It now operates as the Grosvenor House Museum. 41°55′14″N 84°37′54″W﻿ / ﻿41.920556°N 84.631667°W﻿ / 41.920556; -84.631667﻿ (Hillsdale County Courthouse†) Hillsdale The Hillsdale County Courthouse is the third permanent county building located at this site. The yellow sandstone courthouse was built in 1898–99 from a design by Jackson architect Claire Allen. 41°55′18″N 84°37′57″W﻿ / ﻿41.921667°N 84.6325°W﻿ / 41.921667; -84.6325﻿ (Hillsdale Downtown Historic District) Hillsdale The Hillsdale Downtown Historic District is a commercial historic district containing 95 buildings constructed from the 1860s to the 1930s. These include structures associated with many of the city's oldest civic and commercial institutions, and structures that represent many of the broad trends in American and Midwestern architecture extant during Hillsdale's history. 41°55′36″N 84°34′41″W﻿ / ﻿41.926667°N 84.578056°W﻿ / 41.926667; -84.578056﻿ (William R. Kirby Sr. House†) Hillsdale The William R. Kirby Sr. House, constructed in the 1840s, is one of the few early cobblestone houses extant in Michigan. 42°03′08″N 84°24′30″W﻿ / ﻿42.052222°N 84.408333°W﻿ / 42.052222; -84.408333﻿ (W.H.L. McCourtie Estate) Somerset Center This estate was the birthplace of W.H.L McCourtie, a Somerset Center native who made his fortune in the Texas oil boom. McCourtie returned to Somerset Center in 1922 and built an estate as a social center of the town. Around 1930, McCourtie hired two itinerant Mexican artisans, George Cardoso and Ralph Corona, to build 17 concrete bridges here. Cardoso and Corona used a technique known as el trabejo rustico (known in French as faux bois), a Mexican folk art tradition where wet concrete is sculpted to look like wood. The cement constructions remain, and the estate is now McCourtie Park. 41°51′47″N 84°21′53″W﻿ / ﻿41.863056°N 84.364722°W﻿ / 41.863056; -84.364722﻿ (William Treadwell House†) Hudson This house is a two-story brick Italian Villa built for William Treadwell in the early 1860s. Before it was finished, Treadwell famously embezzled $66,000 from the bank he ran and fled town. He was caught, tried, and convicted, but escaped from jail and was finally murdered by an accomplice. 41°46′11″N 84°34′24″W﻿ / ﻿41.769722°N 84.573333°W﻿ / 41.769722; -84.573333﻿ (Trunk Line Bridge No. 237) Ransom Township Trunk Line Bridge No. 237 was built in 1918 by the Michigan State Highway Department according to a standard plan on what was then State Highway 308. The bridge is a concrete, barrel vaulted deck arch bridge. Its single arch spans 31 feet (9.4 m) across Silver Creek. The parapet railings are constructed of solid concrete and have five rectangular recesses on the inside and outside faces. The bridge currently carries the unpaved Burt Road in a rural, wooded area of Ransom Township. 44°11′12″N 83°34′04″W﻿ / ﻿44.186667°N 83.567778°W﻿ / 44.186667; -83.567778﻿ (Alabaster Historic District) Alabaster The Alabaster Historic District encompasses a former open-pit gypsum mine, along with associated processing buildings, shops, and offices, as well as the company town. The mine was established in 1862, but above-ground structures date from after an 1891 fire. 44°28′21″N 83°34′18″W﻿ / ﻿44.4725°N 83.571667°W﻿ / 44.4725; -83.571667﻿ (Cooke Hydroelectric Plant) Oscoda The Cook Dam began generating electricity in December 1911, with an original capacity of 9,000 kilowatts. The electrical output was transmitted 125 miles to Flint at 140,000 volts, establishing a world record. 44°27′19″N 83°40′36″W﻿ / ﻿44.45526°N 83.6766°W﻿ / 44.45526; -83.6766﻿ (Five Channels Dam Archeological District) Oscoda The Five Channels Dam Archeological District encompasses the site of the former worker's camp, used during dam construction in 1911–1912. At the completion of dam construction, the worker's camp buildings were moved to the next construction site (the Loud Dam) or razed. 44°15′13″N 83°26′58″W﻿ / ﻿44.253611°N 83.449444°W﻿ / 44.253611; -83.449444﻿ (Tawas Point Light Station) East Tawas The Tawas Point Light was originally constructed in 1852–53. However, the structure began to degrade, and a new lighthouse was built in 1876 at a cost of $30,000. The tower is 70 feet (21 m) tall including the base, with a diameter at base of 16 feet (4.9 m) and a diameter at parapet of 9 feet 6 inches (2.90 m) It is constructed of a brick outer wall, and an inner wall: 24 inches/8 inches thick, respectively. There is an air space between walls of 24 inches (610 mm). 43°36′21″N 84°46′27″W﻿ / ﻿43.605833°N 84.774167°W﻿ / 43.605833; -84.774167﻿ (Doughty House) Mount Pleasant The Doughty House was built in about 1865 and purchased by Wilkinson Doughty, an early civic leader in Mt. Pleasant, in 1869. He was a founder of Central Michigan Normal School (now Central Michigan University), and lived here until his death in 1909. 43°36′17″N 84°46′54″W﻿ / ﻿43.604722°N 84.781667°W﻿ / 43.604722; -84.781667﻿ (Michigan Condensed Milk Factory) Mount Pleasant The Michigan Condensed Milk Factory (owned by the Borden family) was constructed in 1908 and used as a creamery until 1960. After laying vacant for 40 years, it was refurbished in 2003–2009, and now houses the offices of the City of Mount Pleasant. 43°36′16″N 84°46′34″W﻿ / ﻿43.6045°N 84.7761°W﻿ / 43.6045; -84.7761﻿ (Mount Pleasant Downtown Historic District) Mount Pleasant The Mount Pleasant Downtown Historic District is centered on the intersection of Broadway and Main in Mount Pleasant, and encompasses the surrounding eight blocks of commercial buildings. The district contains 70 buildings dating from the 1870s to the 1950s, primarily brick commercial structures of one or two stories representing Commercial brick, with some Late Victorian, Italianate, Art Deco, and International Style architecture. 43°43′35″N 85°04′34″W﻿ / ﻿43.726389°N 85.076111°W﻿ / 43.726389; -85.076111﻿ (Sherman City Union Church) Sherman City The Sherman City Union Church was built in 1871 as the "Guard of American Revolution Hall," and in 1898 was refitted as a nondenominational church. The church was abandoned in about 1960, but was rescued and refurbished in 1977–78 by local citizens. 43°35′59″N 84°46′40″W﻿ / ﻿43.599722°N 84.777778°W﻿ / 43.599722; -84.777778﻿ (St. John's Episcopal Church) Mount Pleasant St. John's Episcopal Church was initially established as a mission church in 1876 by circuit riders. In 1882, the cornerstone of the current church, modeled on the riding stable of the English estate of the Duke of Devonshire, was laid. The Rt. Rev. George D. Gillespie consecrated the church on January 10, 1884. The church contains historic stained-glass windows representing the Holy Sacrament, St. John the Evangelist, and St. Mary, the Mother of God. In 1996, the church building underwent extensive restoration and renovations, much of which was completed by parishioners. 43°51′40″N 85°50′17″W﻿ / ﻿43.861111°N 85.838056°W﻿ / 43.861111; -85.838056﻿ (Marlborough Historic District) Pleasant Plains Township, Michigan In the 1890s, the Great Northern Portland Cement Company constructed a cement plant at this site to produce cement from the local marl. Production boomed, and in 1902, the company also began construction of a nearby village, dubbed Marlborough, for plant workers. By 1905, Marlborough had 400 citizens, but production problems quickly arose, and the company entered receivership in 1906. The village houses were sold for salvage, the plant was dynamited for scrap iron, and by 1910 only ruins remained. 44°00′19″N 85°36′28″W﻿ / ﻿44.005278°N 85.607778°W﻿ / 44.005278; -85.607778﻿ (John and Katharine Tunkun Podjun Farm) Ellsworth John and Katharine Podjun purchased the land this farm sits on in 1914, and slowly constructed a complex of farm buildings between 1914 and 1930. The entire property is still owned by Podjun family members. 46°21′09″N 85°30′55″W﻿ / ﻿46.3525°N 85.515278°W﻿ / 46.3525; -85.515278﻿ (Luce County Sheriff's House and Jail) Newberry The Luce County Sheriff's House and Jail was built in 1894, only 12 years after the founding of Newberry and 7 years after the organization of Luce County. The opulent structure, built to complement the nearby now-demolished courthouse, reflected the prosperity of the Victorian era community. The structure served as the jail and sheriff's residence for over 70 years. In 1975, the Luce County Historical Society rescued the jail from demolition and in 1976 reopened it as the Luce County Historical Museum. 43°56′57″N 86°27′05″W﻿ / ﻿43.949211°N 86.451342°W﻿ / 43.949211; -86.451342﻿ (S.S. Badger (carferry)) Ludington The SS Badger is a coal-fired ferry carrying both passengers and vehicles. The ship has operated in Lake Michigan since 1953, and is the only remaining coal-fired passenger vessel operating on the Great Lakes. The Badger was originally built as a rail car ferry, but in 1991–92 was refit to exclusively carry passengers and automobiles. She was designated a National Historic Landmark in 2016. 44°03′26″N 86°30′54″W﻿ / ﻿44.057222°N 86.515°W﻿ / 44.057222; -86.515﻿ (Big Sable Point Light Station) Ludington The Big Sable Point Light was built in 1867; at 112 feet it is one of the few Michigan lights over 100 feet in height. The tower is built of brick, but in 1900 a steel plate encasement was constructed around the tower to protect the bricks. The station was the last light on the Great Lakes to be electrified, in 1949. The light was automated in 1968, and still serves as an aid to navigation. 43°57′21″N 86°26′33″W﻿ / ﻿43.955926°N 86.442523°W﻿ / 43.955926; -86.442523﻿ (Warren A. and Catherine Cartier House) Ludington This house was built in 1905 for local businessman and politician Warren Antoine Cartier. 44°01′56″N 86°30′29″W﻿ / ﻿44.032155°N 86.507948°W﻿ / 44.032155; -86.507948﻿ (Lake Michigan Beach House, Ludington State Park) Hamlin Township Architect Ralph B. Herrick designed this beach house for the Ludington State Park in 1933; the beach house was constructed by the Civilian Conservation Corps in 1935. 43°57′13″N 86°28′10″W﻿ / ﻿43.953611°N 86.469444°W﻿ / 43.953611; -86.469444﻿ (Ludington North Breakwater Light) Ludington The Ludington Light Station was established in 1871, but the first light was not lit until 1924. The light tower is structurally part of the reinforced concrete pier beneath it. The light was automated in 1972, and is still used. 43°57′12″N 86°27′34″W﻿ / ﻿43.953333°N 86.459444°W﻿ / 43.953333; -86.459444﻿ (Ludington United States Coast Guard Station) Ludington The first life-saving station at Ludington. was built in 1883. In 1933, the original station was moved to become a private residence, and the set of building currently at the site were constructed. In 2003, ground was broken on a new station nearby, and the Coast Guard moved into this building the next year. 43°57′17″N 86°26′40″W﻿ / ﻿43.954722°N 86.444444°W﻿ / 43.954722; -86.444444﻿ (Mason County Courthouse) Ludington The Mason County Courthouse was built in 1893–94, and is the fourth structure to serve as a courthouse for Mason County. It is a Richardsonian Romanesque structure built of Jacobsville sandstone from Houghton County. Mason County The oral tradition of the Odawa people holds that the Not-A-Pe-Ka-Gon Site, along the Pere Marquette River, was the site of an important 17th century battle between the Odawa and Mascouten peoples. Many men from both sides of the conflict died in the battle, and their skulls were placed on sticks along the riverbank; the site became known as "Notipekago" or "Notipekagon" - literally, "heads on sticks." 43°57′25″N 86°16′48″W﻿ / ﻿43.956944°N 86.28°W﻿ / 43.956944; -86.28﻿ (Scottville School) Scottville The Scottville School was constructed in 1888, and served as Scottville's only school until the 1950s. Additions were made to the school in 1893, 1903, 1911, and 1927. It was used as the high school and middle school until 1976. 43°41′53″N 85°28′54″W﻿ / ﻿43.698056°N 85.481667°W﻿ / 43.698056; -85.481667﻿ (Fairman Building) Big Rapids The Fairman Building was constructed in 1880 for businessman Ferdinand Fairman, who dealt in a substantial amount of real estate, investment, and other non-lumbering activities in what was then a primarily lumbering town. In 2003, the Fairman Building, along with the nearby Nisbett Building, were refurbished into senior citizen housing, and are now known as the Nisbett-Fairman Residences. 43°36′55″N 85°11′34″W﻿ / ﻿43.6153°N 85.1929°W﻿ / 43.6153; -85.1929﻿ (Morgan West Wheatland Cemetery) Wheatland Township The Morgan West Wheatland Cemetery was established in 1864, as African American settlers began migrating to Isabella, Mecosta, and Montcalm Counties. It contains over 50 nineteenth century burial plots, and is still in use today. 43°41′53″N 85°28′54″W﻿ / ﻿43.698056°N 85.481667°W﻿ / 43.698056; -85.481667﻿ (Nisbett Building) Big Rapids Daniel F. Comstock began construction began on the Nisbett Building in 1885; after enclosing and partially completing the ambition project, Comstock went bankrupt. The building was eventually purchased and finished in 1900 by William Nisbett. In 2003, the Nisbett Building, along with the nearby Fairman Building, were refurbished into senior citizen housing, and are now known as the Nisbett-Fairman Residences. Aetna Township The Aetna Earthworks consists of two circular ditch-and-bank structures of around 50 metres (160 ft) diameter located atop a glacial esker. The layout of the site is thought to represent the Midewiwin origin tale of Bear's Journey. Lake City The Boven Earthworks includes four enclosures, with an associated burial mound. 43°17′40″N 85°04′48″W﻿ / ﻿43.294444°N 85.08°W﻿ / 43.294444; -85.08﻿ (Giles Gilbert House) Stanton Giles Gilbert was a significant figure in the lumbering business in Stanton in the late 1860s-early 1880s. In 1877, he built this house for his own use, and lived there until 1882, when he moved to Mecosta, Michigan, to continue lumbering. The house in Stanton was later owned by James Willet, another prominent lumberman and mayor of Stanton. 43°10′48″N 85°15′09″W﻿ / ﻿43.18°N 85.2525°W﻿ / 43.18; -85.2525﻿ (Greenville Downtown Historic District) Greenville The Greenville Downtown Historic District is a commercial historic district containing 60 contributing buildings dating from the later nineteenth and early twentieth centuries. The oldest dates to 1869. 43°10′52″N 85°15′09″W﻿ / ﻿43.181111°N 85.2525°W﻿ / 43.181111; -85.2525﻿ (Winter Inn) Greenville The Winter Inn, built in 1902 by Thomas B. Winter, is significant as a still-functioning example of a modest, locally-owned hotel of a type once common in small towns like Greenville. 43°26′15″N 85°39′45″W﻿ / ﻿43.4375°N 85.6625°W﻿ / 43.4375; -85.6625﻿ (Croton Dam Mound Group) Croton The Croton Dam Mound Group consists of three mounds designated Croton Dam A (20NE105), Croton Dam B (20NE112), and Croton Dam C (20NE116). The largest mound, Croton Dam A, measures about 35 feet in diameter, and included a cache of animal bones and weapons points. The two smaller mounds, Croton Dam B and C, contained red ochre and cremated human remains. 43°26′13″N 85°39′55″W﻿ / ﻿43.436944°N 85.665278°W﻿ / 43.436944; -85.665278﻿ (Croton Hydroelectric Plant) Croton Croton Dam was built in 1907 under the direction of William D. Fargo by the Grand Rapids - Muskegon Power Company, a predecessor of Consumers Energy. The 40-foot-high (12 m) dam impounds 7.2 billion U.S. gallons (6 billion imp. gal/27 billion L) of water in its 1,209-acre (489 ha) reservoir and is capable of producing 8,850 kilowatts at peak outflow. The Croton Dam is one of the earliest examples of the use of hydraulic sluicing in construction east of the Mississippi River. The complex also includes the adjoining powerhouse. 43°28′00″N 85°56′27″W﻿ / ﻿43.466719°N 85.940766°W﻿ / 43.466719; -85.940766﻿ (Fremont High School) Fremont The former Fremont High School consists of three distinct sections: the original two-story Arts and Crafts-inspired 1926 school building, a one- and two- story 1961 International Style gymnasium/natatorium, and a 1988 connector between the two earlier buildings. The building was vacated in fall 2012. 43°29′13″N 85°38′02″W﻿ / ﻿43.486944°N 85.633889°W﻿ / 43.486944; -85.633889﻿ (Hardy Hydroelectric Plant) Newaygo At the time of its completion in 1931, the Hardy Dam was the largest earthen dam in North America east of the Mississippi, and is still the third largest earthen dam in the world and the largest east of the Mississippi River. 43°29′16″N 85°44′22″W﻿ / ﻿43.487778°N 85.739444°W﻿ / 43.487778; -85.739444﻿ (Toft Lake Village Site) Everett Township, Michigan The Toft Lake Village Site, also known by the designation 20NE110, is an archaeological site that was once a Late Middle Woodland village situated on 10 acres on the sandy shore of Toft Lake. 43°48′30″N 86°22′30″W﻿ / ﻿43.808333°N 86.375°W﻿ / 43.808333; -86.375﻿ (Dumaw Creek Site) Pentwater The Dumaw Creek site was once a 17th-century village and cemetery. Archeological artifacts and human remains were discovered on this site in 1915. 43°46′33″N 86°14′16″W﻿ / ﻿43.775833°N 86.237778°W﻿ / 43.775833; -86.237778﻿ (Jared H. Gay House) Crystal Valley The Jared H. Gay House is a log house built in 1861 by Jared Gay and his wife Catherine. The Gays were the first permanent European settlers in the area, and were instrumental in the development of Crystal Valley. They lived in this house until 1902. 43°42′07″N 86°21′51″W﻿ / ﻿43.701880°N 86.364233°W﻿ / 43.701880; -86.364233﻿ (Hart Downtown Historic District) Hart The Hart Downtown Historic District encompasses the central business district of the city. Structures in the district are primarily commercial, but include single family homes and government building as well. The buildings are predominantly one or two stories, and use a variety of construction materials, of which brick and block are most common. Architectural styles include Italianate, Art Moderne and Mid-Century Modern. 43°39′04″N 86°32′21″W﻿ / ﻿43.651111°N 86.539167°W﻿ / 43.651111; -86.539167﻿ (Little Sable Point Light Station) Golden Township The Little Sable Point Light was constructed in 1874 from a design by Col. Orlando M. Poe. The light sits atop a brick tower with a stone base. Prior to 1900, the brick was left in its natural color and state, as it was unusually hard and held up well to the elements. In 1900 the light was painted white for the first time, to assuage the complaints of mariners who said the brick was difficult to see. It remained that color until 1975, when it was sand blasted, and returned to its natural color. The lantern is capped by a copper roof. 43°39′20″N 86°32′15″W﻿ / ﻿43.655556°N 86.5375°W﻿ / 43.655556; -86.5375﻿ (Charles Mears Silver Lake Boardinghouse) Mears Charles Mears was a Chicago lumberman who controlled timberland and owned mills across Michigan. Mears built a number of boardinghouses for his workers; this boardinghouse was constructed in 1866. 43°46′51″N 86°26′25″W﻿ / ﻿43.780833°N 86.440278°W﻿ / 43.780833; -86.440278﻿ (Navigation Structures at Pentwater Harbor) Pentwater The Navigation Structures at Pentwater Harbor include a pair of concrete piers flanking the channel from Lake Michigan to Pentwater Lake, and the pierhead lights at the end of each pier. The channel itself dates to 1855, when Charles Mears first dredged it for his lumber business. 43°44′29″N 86°23′22″W﻿ / ﻿43.741389°N 86.389444°W﻿ / 43.741389; -86.389444﻿ (US 31-Pentwater River Bridge) Weare Township The US 31–Pentwater River Bridge is a three-span steel bridge with a total length of 270 feet (82 m). The two anchor spans are 84 feet (26 m) long and cantilever over the piers to support the 102-foot (31 m) center span, 60 feet (18 m) of which is suspended. 46°35′30″N 89°34′38″W﻿ / ﻿46.591667°N 89.577222°W﻿ / 46.591667; -89.577222﻿ (Bergland Administrative Site) Bergland The Bergland Administrative Site, also known as the Bergland Ranger Station, is a government administrative complex consisting of six buildings, built in 1936 by the Civilian Conservation Corps. It was one of the first administrative offices built in the Ottawa National Forest, and now houses the Bergland Cultural & Heritage Center and The Bergland/Matchwood Historical Society Museum. 46°52′27″N 89°18′40″W﻿ / ﻿46.874167°N 89.311111°W﻿ / 46.874167; -89.311111﻿ (Ontonagon County Courthouse) Ontonagon The Ontonagon County Courthouse is a two-story Romanesque Revival structure, designed by the architectural firm of Charlton, Gilbert & Demar, and built of brick on a sandstone foundation. Three sides have similar facades a central entrance in a gabled pavilion flanked by tall double-hung windows. The building was completed in 1886, but a disastrous 1896 fire destroyed most of the city, including this courthouse. The foundation and brick walls were salvaged, and the interior was redesigned and rebuilt. 46°52′25″N 89°19′07″W﻿ / ﻿46.873611°N 89.318611°W﻿ / 46.873611; -89.318611﻿ (Ontonagon Lighthouse) Ontonagon The original Ontonagon Lighthouse, a wooden structure, was built in 1852/53. This lighthouse quickly deteriorated, and the current lighthouse, constructed of brick, was built in 1866. This lighthouse is a rectangular, 1-1/2-story cream-colored brick keeper's house on a stone foundation, integral with a three-story, 34-foot tall tower. The lighthouse was decommissioned in 1964, and ownership of the structure was transferred to the Ontonagon County Historical Society in 2003. The society undertook a complete restoration of the structure, and conducts tours for visitors. 46°52′08″N 89°18′36″W﻿ / ﻿46.868889°N 89.31°W﻿ / 46.868889; -89.31﻿ (Ontonagon School) Ontonagon The Ontonagon School was originally constructed in 1912 as a high school. The architecturally significant portion of the building is the 1938 elementary school addition. This building, was designed by architect A.B. Nelson to be child-friendly, and features stained-glass art, floor- and wall-tiles with fairytale characters, built-in child-sized benches, reversing blackboards, and an Art Deco fish pond in the kindergarten room. 44°38′57″N 84°07′45″W﻿ / ﻿44.6493°N 84.1292°W﻿ / 44.6493; -84.1292﻿ (Oscoda County Courthouse) Mio The Oscoda County Courthouse was built in 1888–89 at a cost of about $3800 by George E. Hunter from a Classical Revival design by architects Pratt and Koeppe. Unlike the stone and brick courthouses commonly built at the time, the Oscoda County Courthouse is a modest wood frame building, originally sided with wooden clapboards. The building is fronted by a projected bay topped with a hip-roofed steeple. One-story wings extend from both sides of the courthouse. The courthouse was completely destroyed by fire May 5, 2016. 45°01′47″N 84°40′27″W﻿ / ﻿45.029722°N 84.674167°W﻿ / 45.029722; -84.674167﻿ (Frank A. and Rae E. Harris Kramer House) Gaylord Frank Kramer was a Russian Jewish immigrant who settled in Gaylord and began a clothing and dry goods business known as "Kramer's Busy Big Store." He and his wife Rae built this house in 1896. 44°59′09″N 84°27′22″W﻿ / ﻿44.9859°N 84.4560°W﻿ / 44.9859; -84.4560﻿ (Johannesburg Manufacturing Company Store) Charlton Township The Johannesburg Manufacturing Company was incorporated in 1901 by lumbermen Ernest Salling, Rasmus Hanson, and Nels Michelson. The trio built Johannesburg as a lumber mill and company town, and the first building constructed in the new town was this company store. 45°01′41″N 84°40′25″W﻿ / ﻿45.028112°N 84.673486°W﻿ / 45.028112; -84.673486﻿ (James A. and Lottie J. (Congdon) Quick House) Gaylord James Quick was a prominent citizen of Gaylord. He built this house in 1900. In 1921, dentist Charles Saunders purchased the house, and practiced out of it for a time. Saunders lived here until 1970, and his widow lived in the house until 1999. 44°11′46″N 84°28′41″W﻿ / ﻿44.196111°N 84.478056°W﻿ / 44.196111; -84.478056﻿ (Eggleston School) Nester Township Built in 1934, the Eggleston School is a well preserved, former public school with two classrooms and a gymnasium. It is located in southeastern Roscommon County and now serves as a private dwelling. 45°55′00″N 85°55′00″W﻿ / ﻿45.916667°N 85.916667°W﻿ / 45.916667; -85.916667﻿ (Ekdahl-Goudreau Site) Restricted The Ekdahl-Goudreau Site, also known as the Seul Choix site, is an archaeological site located a few hundred feet back from a natural harbor on Lake Michigan. Pottery artifacts date the site to the Late Woodland period. 45°56′41″N 86°14′52″W﻿ / ﻿45.944722°N 86.247778°W﻿ / 45.944722; -86.247778﻿ (Manistique East Breakwater Light) Manistique In the 1910s, a new breakwater was built to protect the Manistique harbor. When the breakwater was finished, construction was started on this light, which was put into service in 1916. As the century progressed, Manistique's importance as a port waned, and the light was automated in 1969. 45°57′47″N 86°15′06″W﻿ / ﻿45.963056°N 86.251667°W﻿ / 45.963056; -86.251667﻿ (Manistique Pumping Station) Manistique The Manistique Pumping Station was constructed in 1921/22, and was in use as a waterworks until 1954. The tower is notable for the architectural approach to the design of the fundamentally utilitarian structure. The exterior of the tower is octagonal, and the interior has 16 sides, strengthening the eight exterior corners that supported the weight of the water tank. 45°55′17″N 85°54′43″W﻿ / ﻿45.921389°N 85.911944°W﻿ / 45.921389; -85.911944﻿ (Seul Choix Pointe Light Station) Manistique This light marks the location of the only harbor in a long stretch of dangerous Lake Michigan shore. Before it was constructed in 1895, there were no lighthouses in a 100-mile stretch of shoreline. The light was designed by Orlando M. Poe, who designed seven other lighthouses in the area. 46°14′49″N 85°55′28″W﻿ / ﻿46.246944°N 85.924444°W﻿ / 46.246944; -85.924444﻿ (Ten Curves Road – Manistique River Bridge) Germfask Township The Michigan State Highway Department developed standard plans for long-span concrete through girder bridges with arched girders on cantilevered brackets in 1921–22. An early version of this type of bridge was the 90 foot span, designated Bridge Number 750 02, built in 1923 for the Germfask crossing of the Manistique River. 46°06′00″N 86°28′30″W﻿ / ﻿46.1°N 86.475°W﻿ / 46.1; -86.475﻿ (Thunder Lake II Site) Escanaba vicinity An archaeological site which is part of the Woodland Period Archaeological Sites of the Indian River and Fishdam River Basins MPS. (#09000523) 142 W. Monroe St.
42°23′31″N 86°15′50″W﻿ / ﻿42.391944°N 86.263889°W﻿ / 42.391944; -86.263889﻿ (Liberty Hyde Bailey Birthplace†) South Haven This Greek Revival farmhouse was built in 1853–1858 by Liberty Hyde Bailey Sr; in 1858, Liberty Hyde Bailey was born in this house. The younger Bailey spent 19 years living here, learning about the local wild animals and plants, before entering Michigan Agricultural College (now Michigan State University) and going on to become a well-known horticulturist, botanist and cofounder of the American Society for Horticultural Science. 42°10′28″N 85°50′26″W﻿ / ﻿42.174444°N 85.840556°W﻿ / 42.174444; -85.840556﻿ (Houppert Winery Complex†) Lawton The main stone building in this complex was constructed in 1940 by William C. Houppert, after a fire destroyed the earlier building. Due to the fire, Houppert went bankrupt in 1943, but the site was operated as a winery by Warner Vineyards until the mid-1970s. It has been refurbished and now operated at the Lawton Heritage Community Center. 42°13′08″N 86°03′04″W﻿ / ﻿42.218889°N 86.051111°W﻿ / 42.218889; -86.051111﻿ (Marshall's Store†) Lawrence Marshall's Store, also known as DeHaven's Store, was constructed in 1874 by Hannibal M. Marshall. In 1906, the store was purchased by Levi C. DeHaven, and was run by DeHaven and Henry R. Phillips until 1965, marking nearly 90 years as the main grocery and dry goods store in Lawrence. The stiore is one of the best preserved and most distinctive Italianate commercial buildings in the region. 42°24′07″N 86°17′17″W﻿ / ﻿42.401944°N 86.288056°W﻿ / 42.401944; -86.288056﻿ (Navigation Structures at South Haven Harbor, Michigan) South Haven The light station at South Haven was established in 1872; navigational structures include piers, the original 1872 keeper's house, and a 1903 cast iron light tower. 42°13′05″N 85°53′29″W﻿ / ﻿42.218056°N 85.891389°W﻿ / 42.218056; -85.891389﻿ (Paw Paw City Hall†) Paw Paw This Greek Revival structure was built in 1842–1845 as the first Van Buren County Courthouse, a function it served for over 50 years. In 1900, it was moved from the courthouse site to its present location, and now serves as the Paw Paw City Hall. 42°12′58″N 85°53′27″W﻿ / ﻿42.216111°N 85.890833°W﻿ / 42.216111; -85.890833﻿ (Van Buren County Courthouse Complex†) Paw Paw This Classical Revival structure, designed in 1901 by Jackson architect Claire Allen, has served as the Van Buren County Courthouse for over 100 years. 44°15′07″N 85°23′55″W﻿ / ﻿44.251944°N 85.398611°W﻿ / 44.251944; -85.398611﻿ (Cadillac Public Library) Cadillac The Cadillac Public Library, now the Wexford County Historical Society Museum, was constructed as a Carnegie Library in 1906 at a cost of $30,000. 44°15′01″N 85°23′38″W﻿ / ﻿44.250278°N 85.393889°W﻿ / 44.250278; -85.393889﻿ (Frank J. Cobbs House) Cadillac Frank J. Cobbs was the son of Jonathan W. Cobbs, who, with William W. Mitchell, founded the lumbering firm of Cobbs & Mitchell which was a large employer in Cadillac for decades. Frank J. Cobbs built this house in 1898, the year he was married and his father died, leaving the management of Cobbs & Mitchell to Frank. 44°14′54″N 85°23′52″W﻿ / ﻿44.248333°N 85.397778°W﻿ / 44.248333; -85.397778﻿ (Cobbs and Mitchell Building) Cadillac Cobbs & Mitchell was among the largest lumbering firms in Michigan, at its high point, using 100,000 feet of raw lumber daily. In 1905, Cobbs & Mitchell hired George D. Mason of Detroit to design this brick and limestone building as a showplace for their products. The building is finished throughout using nine varieties of wood native to Michigan: elm, white maple, bird's-eye maple, sap birch, red birch, curly red birch, red beech, red oak and hemlock. 44°14′58″N 85°23′57″W﻿ / ﻿44.249444°N 85.399167°W﻿ / 44.249444; -85.399167﻿ (Elks Temple Building) Cadillac The Cadillac Elks Temple, built in 1910, was designed by the Grand Rapids architectural firm of Osgood & Osgood, who specialized in designing similar buildings for fraternal organizations. 44°15′05″N 85°24′00″W﻿ / ﻿44.251389°N 85.4°W﻿ / 44.251389; -85.4﻿ (Masonic Temple Building) Cadillac The Cadillac Masonic Temple, built in 1899, is a three-story Romanesque brick and stone commercial building measuring 75 feet (23 m) by 100 feet (30 m). 44°15′06″N 85°23′53″W﻿ / ﻿44.251667°N 85.398056°W﻿ / 44.251667; -85.398056﻿ (Charles T. Mitchell House) Cadillac In 1874, Cadillac founder George Mitchell built this house in the Second Empire style, including ornate carved woodwork inside and a mansard roof outside. Mitchell lived there until 1878; in 1922, his great-nephew Charles T. Mitchell purchased the house, and in 1926, completely renovated it to reflect the then-current Prairie School trend in architecture. 44°15′05″N 85°24′02″W﻿ / ﻿44.251389°N 85.400556°W﻿ / 44.251389; -85.400556﻿ (Old Cadillac City Hall) Cadillac The Cadillac City Hall was built in 1901 and used for city offices until 1977. 44°14′56″N 85°24′00″W﻿ / ﻿44.248889°N 85.4°W﻿ / 44.248889; -85.4﻿ (Shay Locomotive) Cadillac This engine is a Shay locomotive engine designed by local logger Ephraim Shay. The Shay locomotive was small and powerful, and was built to operate on temporary tracks to haul logs. It was geared to operate on steep grades and articulated to handle sharp curves. Wikimedia Commons has media related to National Register of Historic Places in Michigan. ^ The West Jefferson Avenue – Rouge River Bridge is split between Detroit and River Rouge. ^ The following sites are listed in multiple counties: Jefferson Avenue-Huron River and Harbin Drive-Silver Creek Canal Bridges (Monroe and Wayne), Main Street Historic District (Milan, Michigan) (Monroe and Washtenaw) and Clinton-Kalamazoo Canal (Oakland and Macomb). ^ a b c d e f g h i j k l m n o p q r s t u v w x y z aa ab ac Numbers represent an ordering by significant words. Various colorings, defined here, differentiate National Historic Landmarks and historic districts from other NRHP buildings, structures, sites or objects. ^ a b c d e f g h i j k l m n o p q r s t u v w x y z aa ab ac The eight-digit number below each date is the number assigned to each location in the National Register Information System database, which can be viewed by clicking the number. ^ Pewabic coordinates from: National Oceanic and Atmospheric Administration (February 13, 2013), Pewabic, archived from the original on January 8, 2015, retrieved September 8, 2016 . ^ a b c d e f g h i j k l m n o p q r s t u v w x y z National Park Service (2008-04-24). "National Register Information System". National Register of Historic Places. National Park Service. ^ The NRIS gives the location of the Holtz Site as "Address Restricted." However, Lovis ( William Lovis (June 1971), "The Holtz Site (20AN26), Antrim Co., Michigan; A Preliminary Report", The Michigan Archaeologist, 17 (2) ) gives the location of the site. Geo-coordinates are approximate. ^ The Sand Point site is an address restricted site, but is described in the following document as being "east and south" of the camping facility maintained by the Keweenaw Bay Indian Community, on land owned by the KBIC: Sand Point Concept Master Plan (PDF), Keweenaw Bay Indian Community The geographic coordinates given are approximate. ^ Hoffman, Lisa M. (2012-05-17). "Twin Falls Bridge Nominated". The Daily News. Iron Mountain, MI. Archived from the original on 2013-01-13. Retrieved 2013-07-20. ^ Staff. "Oscoda County Courthouse". State Historic Preservation Office. Michigan State Housing Development Authority. Retrieved April 6, 2012. ^ This site is listed in the NRIS as "address restricted." However, Dunham ( Sean Barron Dunham (2014), Late Woodland Settlement and Subsistence in the Eastern Upper Peninsula of Michigan (PDF) ) gives the location. The listed geo-coordinates are approximate.